The time comes in every employee’s life when they’re ready for more. Whether that’s a better job title, an increase in pay, or just more responsibility, most people who have a career path want to move up in some way. However, no matter how ready you may be for a new move, promotions aren’t simply handed out; it’s up to you to do everything in your power to stand out in your organization and show why you deserve a promotion. Furthermore, it’s important to remember that sometimes a promotion might not look exactly how you pictured. Instead of an upward move, you may make a lateral one to increase your skill set or work at your dream company. However you’re hoping to advance in your career, these tips can help you put yourself ahead of your colleagues and get promoted at work. Whether this is with your boss, your co-workers, or even people in your field, building your network and being sociable are always good ideas. Attend after-work events, join (or start) an athletics team with your co-workers, and attend company parties and other events where you’ll have the opportunity to mingle with your fellow colleagues. By building bonds with those around you, you’ll demonstrate to your boss that you’re well-liked, which shows that you’d be received well as a leader and solidifies the idea that you’d serve well in a higher role. Of course, the key to this is socializing with co-workers appropriately and making sure you aren’t speaking negatively about work when you do; you never know what could come back to haunt you. Recognizing a problem within any organization is easy, and more often than not, your superior is already aware of said problem. That being said, don’t present or whine about a problem to your boss without having thought through possible solutions beforehand. Better yet, take the initiative to come up with a solution and then give it a shot to see if it works for yourself, unless failure would be detrimental to your company. In that case, or if you’d feel more comfortable speaking with your boss first, present your solutions to your boss to get his or her input and advice on which solution would work best. Then offer to implement it. They’ll appreciate your ability to think through the problem yourself before coming to them. They’re likely already dealing with enough. It’s no secret that the more skills you acquire and the more you broaden your knowledge, the more valuable you become as an employee. This is especially true if you gain specific skills that could directly benefit your organization. In our increasingly technological world, advancing your skill sets and acquiring new ones is dire to maintain your marketability, and the more marketable you are, the greater chance you have of receiving a promotion. It’s also important to also keep up on news and events happening within your industry to stay current and in-the-know. Whether it’s in your department or not, don’t be afraid to seek out new responsibilities and work. Or simply ask your superior for more work. Either way you go about it, by asking for more, you demonstrate your desire and commitment to your department and company, and your interest in helping the company succeed. You ultimately increase your value within your organization, displaying yourself in positive light that demonstrates your promotion-worthy characteristics. While there are a few select careers in the world where you work alone, they tend to be few and far between. Most positions require you to, at some point, work together with your specific department team or with other departments within your company. It’s important to not only be willing to work with others, but to share any success you have with your team and to avoid pointing fingers when failure arises. Anyone already in a higher role will tell you that the key to being a good leader is knowing how to be a great team player. Nothing is worse than being the constantly negative and whining employee. Your boss wants to know that you like your job, because if you’re not invested in your work and only find things to complain about, you don’t seem like a candidate for promotion. Furthermore, don’t get entrenched in any office drama; yes, it can be difficult at times to work with different personalities in close spaces, but try to keep the complaints and gossip to a minimum. A good leader knows how to keep morale high even at the toughest and most stressful of times. If you’re looking to be promoted, learn to stay positive no matter the situation and learn to be emotionally intelligent with those around you; your boss will see a potential leader worthy of the next step. This probably goes without saying, but in order to stand out from the pack, you have to go above and beyond your duties. If you’re required to work 9 a.m. to 5 p.m., come in earlier and stay later. While I’m not telling you to eliminate a healthy work-life balance, you also can’t be afraid to go the extra mile every now and then, in order to get more done or get ahead. Moreover, it doesn’t matter if “you’re not paid to do that.” Don’t hesitate to do things outside of your job description no matter how minuscule they may seem. Work harder than those around you and make everything you do count. Don’t do the bare minimum of anything, try your hardest on every task you’re given. It can be frustrating waiting for a promotion and nerve-wracking to ask for one. However, if you’re doing all of these things, you’ll demonstrate your commitment and increase your value to your company. By transforming yourself into a valuable leader and employee, you’ll find yourself moving up the ladder or on to bigger and better roles in no time. 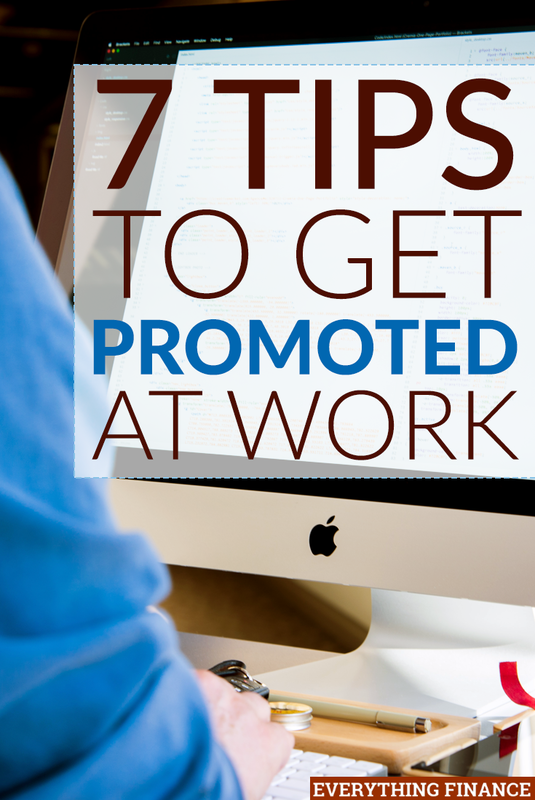 Have you done any of these things in order to get promoted at work? Should Women Negotiate Like Men? Would a job in finance suit you?